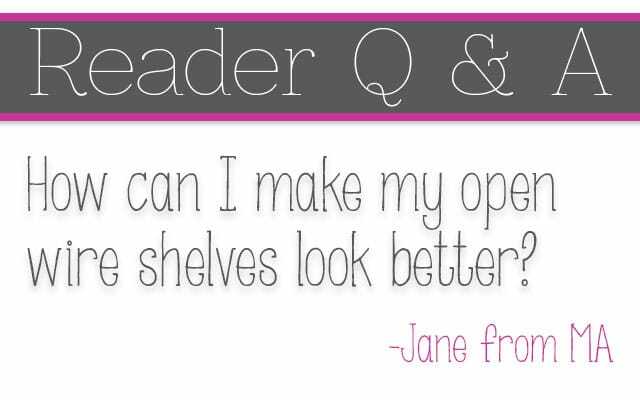 Ok, how many of you are living with open wire shelving in closets, pantries, or laundry rooms? Do you struggle making the shelves look good and/or keeping them organized? I’m trying to come up with a solution for an unsightly area in my laundry room. Above the washer and dryer are two fairly long shelves– the white wrapped metal ones used for closet organization and lots of other things. We have lots of cleaners, laundry bottles, etc. up on the shelves looking messy, too exposed and unpleasant, no matter how carefully placed. We can’t afford to build cabinets to store all this stuff. I’ve seen these kinds of shelves covered with a fabric “curtain” using a Velcro strip, but they look tacky. Maybe it was the fabric design, but the look isn’t stylish. Would you have a moment to suggest something cool? The odd person that I am, I was actually wishing I had either wire shelves somewhere to style in different ways OR that I had an unlimited budget so I could install some wire shelves just to play with them and show Jane a few ways to make the most of them. Since that’s isn’t my reality, I found several great ideas around the web to share! 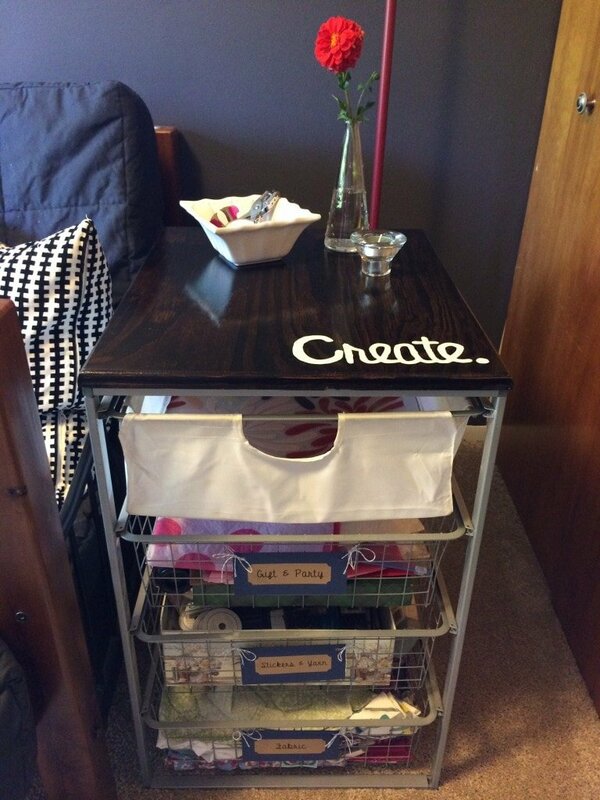 Angela from Blue i Style did a great job on her nursery closet. 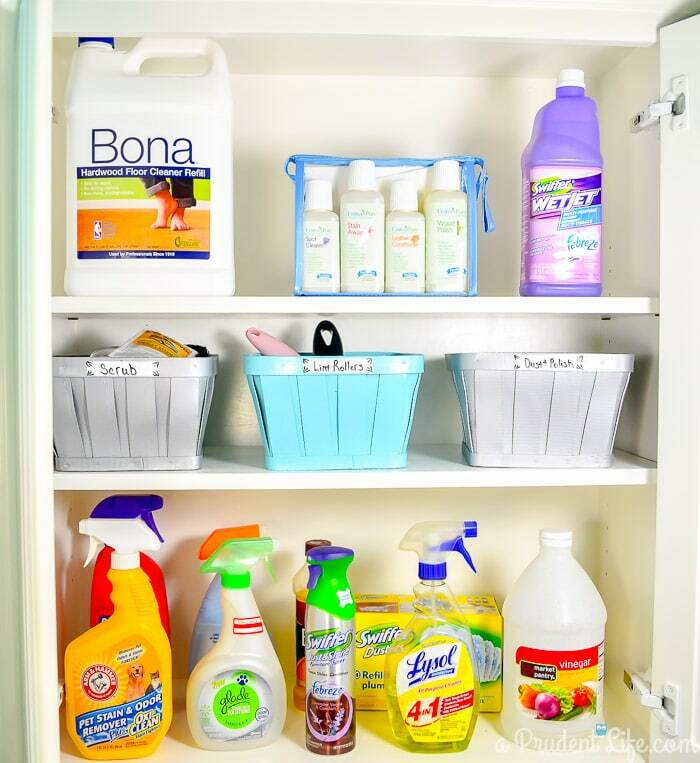 Items that would normally be cluttering the shelves are hidden away, but easy to find because of clear labeling. 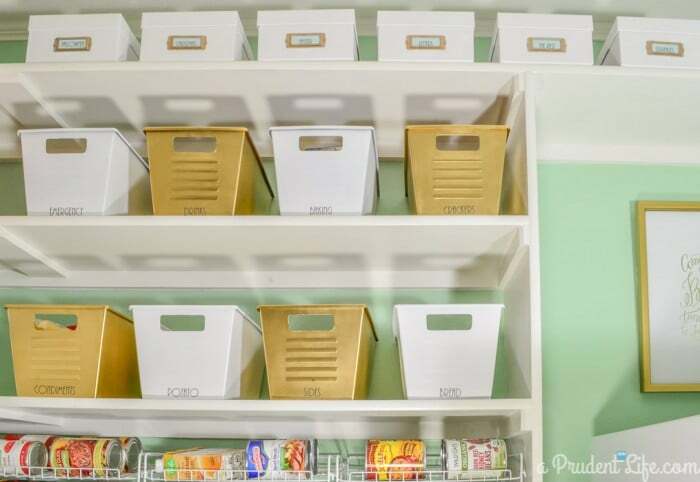 Flat sided bins maximize space, and the matching bins make the space look cohesive. Although my pantry shelves are wood, I used the same technique. The gold & white bins below are actually plastic and from Dollar Tree. They used to be oddly colored, but a coat of spray paint later I had very inexpensive hidden storage for open shelves. To makeover the shelves themselves, you could embrace the industrial trend like Sypsie Designs did with her wire storage unit. Wire shelving is usually white on white. But what if you painted the white a nice gray, then added thin wood to the shelves? You can even have the wood cut to size at Lowes. Minwax has staining cloths now that making staining small projects easy and affordable. It would be a HUGE transformation without a huge price tag. You could also make a wood overlay like Erin from Lemons, Lavender & Laundry. Click here for her tutorial. 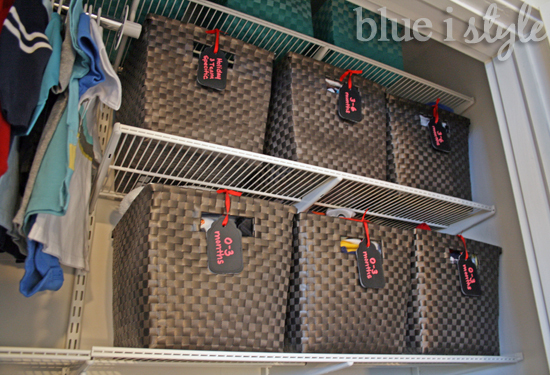 Jen from IHeartOrganizing came up with an inexpensive and brilliant way to add shelf liner to wire shelves. Foam board! Check out her post to see how she did it. options on Amazon (affiliate links) that would make any space look spectacular! You could have the look of metal, marble, or wood. Ok, do you ever watch House Hunters and get SO annoyed at the real estate agent for taking the clients to a property that is exactly what they said they DIDN’T want or need? I’m going all House Hunters on reader Jane for a moment. Her email clearly said they couldn’t do cabinets right now, and option #4 is all about cabinets. But unlike House Hunters, I’m not going to blow the budget! Kelly from View Along the Way has an AMAZING example of why Jane shouldn’t rule out cabinets. 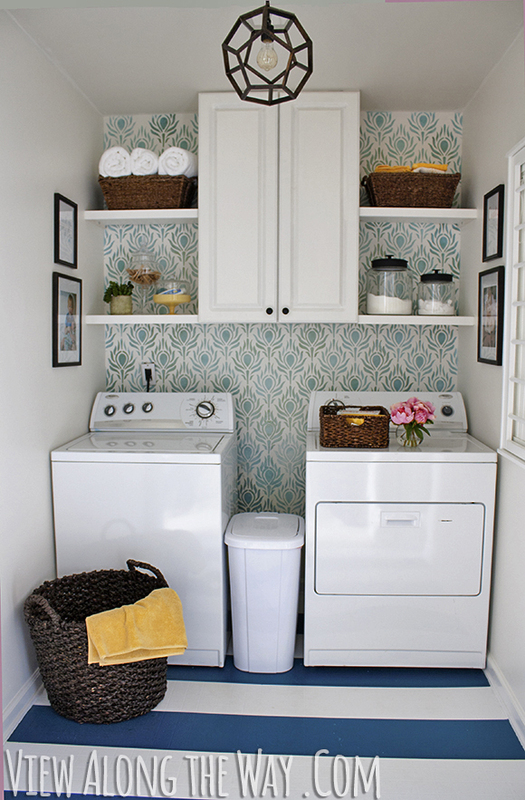 Kelly used to have an ugly room with wire shelves, then they turned it into a stunning laundry room for a total of $157! Even better, the cabinet portion was a $20 garage sale find and the shelves on either side were scrap lumber. To score a cabinet on the cheap, check out a Habitat ReStore, Craigslist, garage sales, or even consider an unfinished cabinet from a big box store. I saw brand new upper cabinets in the $50 range locally, but I’m sure prices vary across the country. If you aren’t able to hang the cabinet yourself, consider swapping labor with someone who can. Like a handy dad who’d love you to babysit his kiddos for an evening! Win-win! One of my best tips for organizing a space is to take EVERYTHING out. Once your shelves are clear, rethink every single thing before you put it back. It’s like magic. When you are staring at packed shelves, it seems like you need every item. But when you looking at a nice empty shelf, there is a tendency to want to keep it that way. Over time, we had accumulated a ton of cleaning products in the laundry room. The number of them that we actually used/needed was much smaller. Less stuff = less cluttered shelves + a chance to donate things. I gotta tell you, now I’m dying to try an industrial chic makeover of some wire shelves! I hope some combination of these options will work for Jane and anyone else that’s struggling with this issue. If you need a reminder for later, I made a handy image for you to pin below! Love these ideas! I need to implement some of them in my laundry room! Great ideas! We are in the middle of a laundry room renovation and I was so happy to remove all the wire shelves! I have taken every thing out of the laundry room and temporarily put into the garage until the cabinets come in. In addition to the regular wall 30s for over the washer and dryer, we ordered some of the smaller cabinets that you normally see above a fridge. Those will be mounted at the top of the wall/ceiling for concealed storage. I work for a cabinet manufacturer,so this was a nice, affordable splurge, but the small cabinets are very inexpensive if you buy the unfinished stock cabinets at a Lowe’s or Home Depot. Once the cabinets come in and are ready for install I am going to be ruthless about what goes back in…going through your stuff is more important than ALL the concealed storage in the world! What is this purging you speak of? How does someone learn to do that? Is there a tutorial? 🙂 I need to purge my whole house and start over!! Great tips! 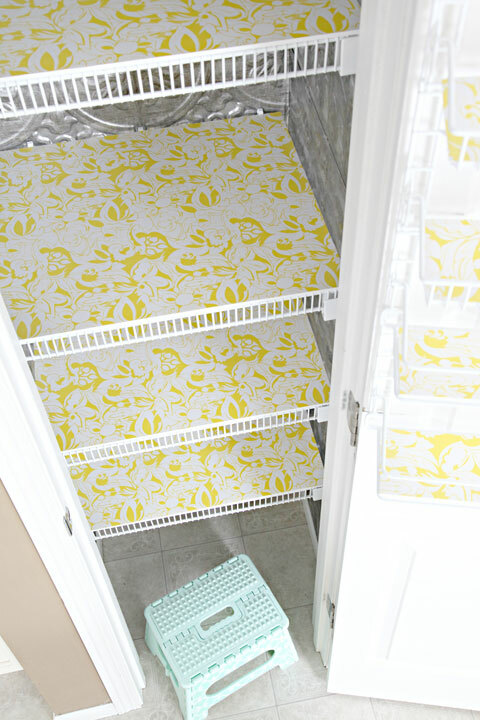 I love the shelf liner paper idea! These are GREAT ideas! I think I get more annoyed with those House Hunter shows when the realtor shows them exactly what they asked for and they hate it. Uh, what? Yes!!! That’s awful too! If these people would just let us make their decisions for them it would be so much better.